What? What do you mean it’s not Wednesday? RIGHT! My brother was in town on business from Vancouver on Wednesday, and I was so happy to get to see him and have dinner with him after not having seen him in 14 months, I forgot to post. So this week, Spinning Wednesday has been postponed until Friday! Last weekend, I broke my (albeit short) spinning hiatus. 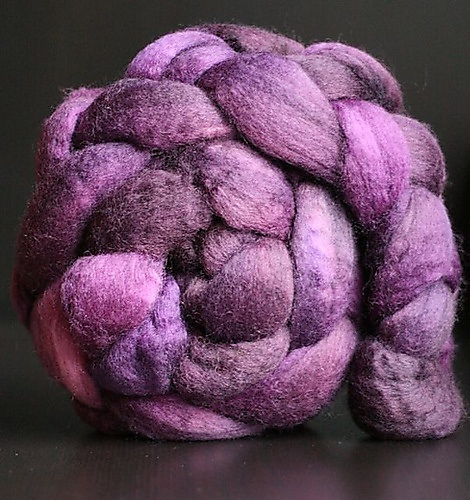 I had been dreading spinning, because I was trying to spin a particular braid of BFL and it was not going well. This braid was one I tried to spin on my spindle last year, and frankly, it was a bloody nightmare. I was sure it was felted. Matted and clumpy, and I could not seem to get a decent amount to spin, and when I did it just looked bad. After my very experienced friend Val examined it and determined it wasn’t felted (hey – I was and still am a newb – what did I know?) I was hell bent on trying it again. Well I did…and I am done. To make a long story short, life is too short to drink bad wine, knit with bad yarn and spin with fibre that makes you want to rip your hair out, especially when one has a lovely stash of some 40 other lovely braids from which to choose. 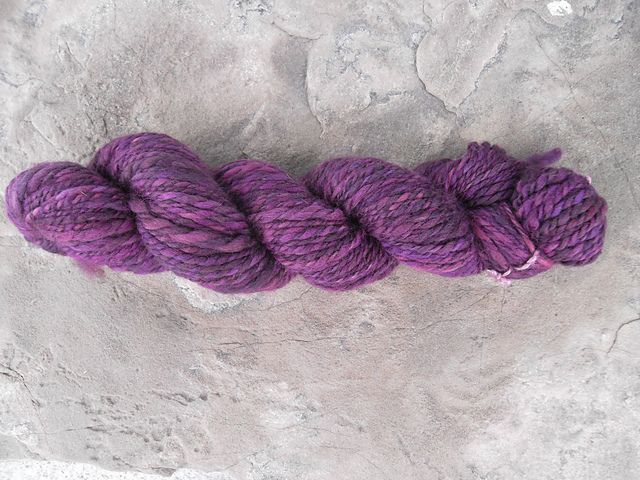 So I tossed it and went stash diving…and located a lovely braid of Bee Mice Elf Superwash BFL in Plum that I purchased in a destash from Jacqueline, the woman who has contributed most, in several ways, to my fibre stash. My first 4 oz skein of yarn! Now, when I say it’s 4 ounces, it’s actually a touch less, because I had a few yards left in one single, and I Andean plied that, so it sits separate from this. I have also figured out that I am underspinning a little, because I have seen the twisted mess that results from overspinning, and I think I am overcompensating in the other direction. The biggest issue with that is that when I need to pull the single through the orifice because it has flown out of my hand, if disintegrates and I fight with getting it back. As a result of these little arguments, some bits of fibre may have ended up in the trash. But overall, it’s pretty much the whole braid. I was pretty proud of this skein – I ended up with 130 yards, which is safely in the bulky-ish range, although I have not measured the WPI, which I should. I gave it a soak and it looked more like it was thinner and more even than anything I had previously spun. Then it dried. When it did, it fluffed up again, and now to me, this looks almost exactly the same as the last fibre I spun, which truthfully is a touch disappointing, as I want to be getting better. But I keep reminding myself that it will take practice and I need to be practicing more consistently. Right now, I am in the middle of multiple knitting projects and with it being winter, hats and DK weight socks have taken precedence over spinning. But I know I should be spinning daily, even if it’s only for a short time each day, so that I can improve. 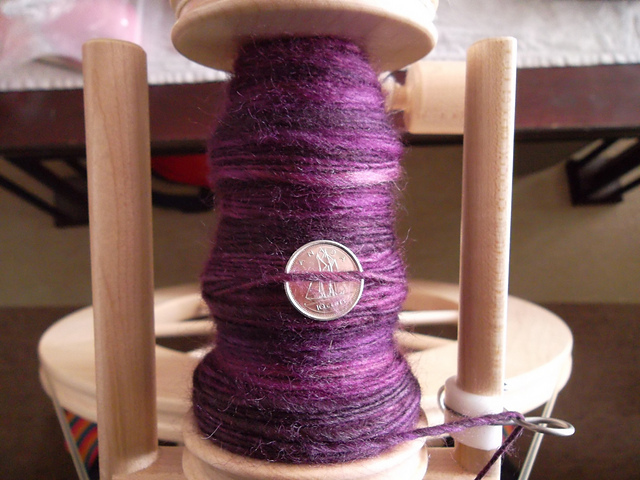 This entry was posted in Uncategorized and tagged spinning bfl by Rayna. Bookmark the permalink.